Seoul, South Korea & Los Angeles, California (June 4, 2018) – CJ 4DPLEX, the world’s first and largest 4D cinema company, continues to break records in 2018. 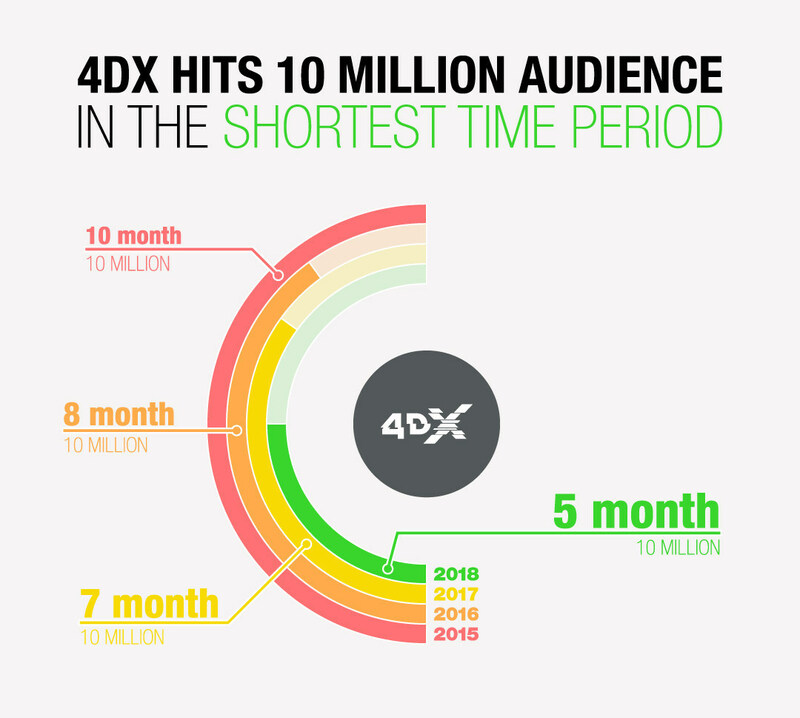 With May having come to a close, global 4DX attendance has passed 10 million attendees through the first five months of the year – the quickest to reach this milestone in history. Additionally, since the fastest-growing premium cinema format first launched in 2009, more than 75 million people have experienced the innovative experience, which includes motion seats and environmental effects such as rain, wind, snow, bubbles and various scents. The 10 million attendee mark is reached faster each year, as new 4DX locations are added, new Hollywood blockbuster movies are shown, and the format continues to grow in popularity. For example, in 2017, it took seven months to reach 10 million, compared to eight months in 2016 and 10 months in 2015. Gross box office also continues to grow each year. Year-to-date, 4DX movies have grossed more than $125 million at the global box office in five months, more than half of the total 4DX box office through 12 months of 2017. In particular, China has been driving 4DX expansion and has become a powerhouse, increasing its total number of screens by 62 percent over the past 12 months. From June 1, 2017 through May 31, 2018, 76 new 4DX screens opened in China, which is the world leader with 197. The U.S., Canada and Europe are also seeing strong growth. In North America, attendance through the first five months of 2018 is 70 percent greater than the same period in 2017. Growth was more significant in Europe, with 4DX attendance doubling over that same time period, year-over-year. France continues to be a very powerful market for 4DX, accounting for eight percent of total worldwide box office in 2018 despite only making up three percent of locations. CJ 4DPLEX is the world’s first 4D cinema company, headquartered in Seoul with international offices in Los Angeles and Beijing. The company created 4DX, the first and leading 4D cinema technology for feature films, providing moviegoers with an immersive cinematic experience that utilizes all five senses, allowing the audience to connect with movies through motion, vibration, water, wind, snow, lightning, scents, and other special effects that enhance the visuals on-screen. CJ 4DPLEX brings 4DX auditoriums to exhibition partners along with 4DX codes for both major Hollywood blockbusters and local titles. Each auditorium incorporates motion-based seating synchronized with more than 20 different effects and optimized by a team of skilled editors, maximizing the feeling of immersion within the movie, beyond the limits of audio and video. Since 2009, more than 530 Hollywood and local titles have been screened in 4DX. As of April 2018, more than 62,000 4DX seats operate in 526 auditoriums spanning 59 countries. CJ 4DPLEX was named a Most Innovative Company of 2017 in Live Events by Fast Company. The company was awarded the Silver Edison Awards in the Media and Visual Communications-Entertainment category in 2015 and 2018. For more information, please visit www.cj4dplex.com.